There is a short report in the December 2015 issue of the Tôken Bijutsu that I read with great interest and that I wanted to work into a smaller article on my site. The report in question is about an early Edo period sword fitting workshop that was discovered during construction work for a new apartment building in the Yanagimachi (柳町) neighborhood which is located a little to the southwest of downtown Nara. Well, as so often, a lot of things are going on and I had to put that article idea aside but the other day, Ford Hallam put a link to a short YouTube video on Facebook that briefly shows some of the discovered items that were on display at a small local special exhibition on the find. The video by Sankei News is neither long nor very detailed but you can see the items much better than in the black and white Tôken Bijutsu article and with this, I thought I better introduce that issue on my site too as next to nothing is known about such cast workshops. First of all, the finds. Discovered were about 800 items and fragments related to tsuba casting and about 600 of such for menuki, the majority being kikka-sukashi models for tsuba and dragons for menuki. Also found were more than 200 spherical melting pots, some with handles, some with three legs, and fragments of copper and zinc were confirmed on some of them, the “ingredients” you need for making brass (shinchû, 真鍮). 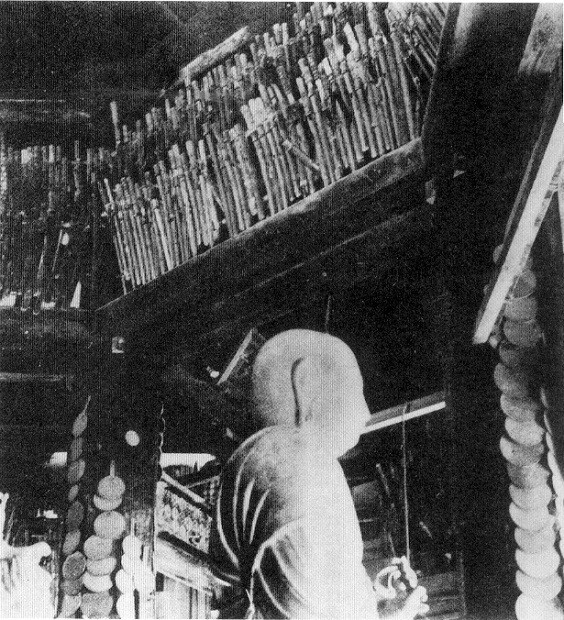 The Tôken Bijutsu report says that so far, it was thought that brass was not produced in Japan until the latter half of the 17th century (up to that time it was imported) and that this find, which is dated to the first half of the 17th century, obviously predates that assumed starting point of local brass production. According to the report, the Yanagimachi area where the workshop was found was not settled in the Keichô era (1596-1615) but we have records that at the latest by Kan’ei eight (1631), 21 so-called yakuya (役家) resided there. Yakuya were families who held land tenure on the basis of socage. It seems that not much is found in period records and the first historic document that goes more into detail is the Nara Zarashi (奈良曝) topography/local history of the town published in Jôkyô four (1687). Therein we read that at that time, 14 swordsmiths, 14 saya lacquer artists, and 17 sword polishers were living and working in Nara. And for Yanagimachi we find listed a swordsmith named Kichibei (吉兵衛), a saya lacquer artist named Kansuke (勘介), and a polisher named Kiya Gohei (木屋五兵衛), the latter most likely coming from the renowned Kiya family of sword polishers whose main line had been working (like the Hon’ami and the Takeya) for the bakufu. The source does not mention any sword fittings makers but the find of the cast workshop combined with the listed names and professions strongly suggests that a thriving sword manufacture community had existed in Nara during the early Edo period. The fact that only the first and not the smith name of the swordsmith (i.e. the alias with which he signed) is quoted might not mean anything but it could suggest, again with the cast workshop in mind, that he was one of the many below-of-the-radar smiths and this in turn brings me to another point that made we wonder whilst thinking about the discovery. Incidentally, when I checked the meikan to see which smiths worked at that time in Nara, I could not find any smith with the first name Kichibei/Yoshibei but again, this does not necessarily mean much as the first names of the lesser known smiths were often not recorded and fell into oblivion. And almost all Nara-based smith of that time, i.e. Kanbun and Enpô, were from the Monju School, i.e. the Sue-Tegai lineage that made it into the Edo period. What made me wonder were the circumstances of the emergence of such small local sword manufactures who obviously did not produce “daimyô level” swords, or not even mid-level bushi swords. Well, smaller or larger sword manufactures under the jurisdiction of local feudal lords had always existed as not every fief or region was receiving from the large sword centers like Osafune or Seki of course and as the equipment of the own men had to be ensured no matter what. And also safe to assume is that the fittings of the tens of thousands of mass produced swords that were exported to Ming China (more details here) were equipped with the cheapest kind of fittings. I am not talking about special presentation and special order swords as they were surely of at least decent make. As mentioned in the linked article, contemporary records say that most of the export swords were made in Nara and Bizen but we are talking here about the early 1500s at the latest and with the ongoing Sengoku era and all what took place during the reigns of Nobunaga and Hideyoshi, it is not unusual that many of the Nara-based manufactures had simply disappeared from the face of earth by a century later. So why were some of these relative cheaply producing workshops reemerging during the early Edo period and were still working when the general demand for swords was declining? I think that this issue is linked to the then changes within the bushi class. So even if the demand for newly made swords surely declined from the end of the 17th century onwards, we are facing with the early 17th centuries’ continuous expansion and formulation of the Tokugawa-bakufu a certain change in the wearing of swords. It was the time when for the first time a “uniform” for all samurai was introduced and all things office-related – i.e. garments, hairstyle, swords – were dictated by the bakufu. Now each member of the bushi class from a certain rank upwards was required to wear the daishô pair of swords when on duty and rules were even stricter when operating in Edo (see also here). I don’t want to go too much into detail here about what sword form developed from what sword but as everybody knows, by the beginning of the Edo period, a samurai was wearing the typical daishô pair consisting of a katana and a wakizashi mounted in more or less matching koshirae. But before that time, i.e. pre-Momoyama and Sengoku, the uchigatana or katateuchi, the forerunner of the katana, worn by the lower ranking warriors and ashigaru was nothing more than a weapon and so to speak furnished in the minimum requirement to be used. I want to cite the special case of the Sai’en-dô (西円堂) at this point to demonstrate what I mean. This side temple of the Hôryû-ji in Nara is a rare stroke of luck for the studies on Muromachi-period swords and mountings as it stored until recent times hundreds of weapons (see picture above) offered to it, or rather to the healing Buddha Yakushi-Nyorai (薬師如来) to which the temple is dedicated. At some of the swords the tsuba or other fittings were removed again later to reuse them on other swords but still many “intact” specimen have survived. The picture below shows what I meant with “minimum requirement,” that is, many of these basic uchigatana had no decorative elements whatsoever. They had a fuchi and kashira that held the hilt together, a kurigata for tying it with a cord to the obi, a kaerizuno so that the sword doesn’t slip out of the obi, and a rudimentary hilt wrapping. Some were equipped with a kozuka (most of the kozuka are missing so only the slots in the saya remain) and many did not even have a tsuba, i.e. were mounted in aikuchi style, and as many did not feature any menuki. As mentioned, these specimen show the very basic mounting that is necessary to make a sword use and wearable. Such utilitarian swords basically disappeared with the disarming of the civilian population started by Nobunaga and finished by Hideyoshi, the so-called katanagari (刀狩り, “sword hunt”), and the subsequent regulations issued by the Tokugawa-bakufu. Whilst Nobunaga and Hideyoshi first of all sought to ensure with the katanagari that no one could take the country by force, Ieyasu’s rules were more about making sure that only the bushi class had nationwide the monopoly on violence, with the sword pair as easy-to-grasp symbol of being legally allowed to use physical force. From now on, it was unthinkable for even a lower ranking samurai to wear some kind of cobbled together uchigatana, no, you were required to wear a decent daishô when doing duty. Of course there were also semi-bushi class persons who ranked even lower and not every simple rural duty required a full daishô and as mentioned in an earlier article, there was no “sword police” going round that checked if every coutryside samurai had a sword with a proper tsukamaki for example and no plaintiff, no judge. So it was pretty much like if you are a soldier today doing duty on some desert base with just you and your guys all year long. Nobody complains if you show up in the morning with your shirt open. But the fun stops as soon as the base has a certain size or when you have to show up at another base. You don’t want to embarrass yourself or worse, your superior. Back to the early Edo period. Now every sword and short sword that was worn when on duty had to be equipped with a proper tsuba, tsukamaki, fuchigashira, and menuki. (Again, I am not talking about special cases, koshigatana with unwrapped hilts, swords in private collections etc. I am referring to the majority of swords.) Now comes some numbers game. It is estimated that the samurai class made up about 10% of the Japanese population. In the early Edo period, Japan had a population of about 12,000,000 to 18,000,000 and about steady 30,000,000 from Genroku (1688-1704) to the end of the Edo period. So if we start with 12,000,000, about 2,500,000 swords (daishô, thus times two the 10%) have been worn at any given day in the early, and about 6,000,000 swords throughout the later Edo period. Well, tsuba and sword fittings were of course reused and handed down in the peaceful Edo period but still, there must had been a production line for the cheaper swords and therefore it is in my opinion only logical to accept that there were many more of such cast workshops like the one discovered in Nara. I also think that the majority of these relative cheap fittings just did not survive or was melted down for casting metal fittings. Thus we are hardly talking about them today. These are my initial thoughts on the matter for the time being and maybe some more sites are discovered in the future as it is hard to develop a proper theory on just that one find. Last but not least, some more pictures can be found in the Sankei article here. And thank you Ford for pointing out that video. Das ist sehr interessant ! Erinnere mich das man doch schon mal hin und wieder gegossene Tsuba zu sehen bekam und die Gußspuren noch gut zu sehen waren……Gußspuren wurden und werden ja sehr schnell mit ” fake” Chinaschrott verbunden. Womöglich sind diese “fake” Tsuba sehr wohl ” echt” aber eben die billig herzustellende Variante. Ich schätze das man wohl nicht drum herumkommt solche Tsuba etwas differenzierter zu betrachten. Vorschnelle Urteile wird man hier wohl etwas korrigieren müßen.